Newcastle, Australia via Los Angeles punk sweethearts The Gooch Palms have firmly planted their feet in American soil and have played over 150 shows across the USA and Canada to packed rooms and rave reviews since arriving in March 2015. They are fast becoming known as one of the most entertaining live bands in America, something audiences downunder have known for years! Their debut album NOVO'S was released in 2013 on Australian label Anti Fade Records and has since been re-released on Burger Records in the USA and Surfin Ki Records in Europe. Despite being extremely busy with touring in 2015 the duo still managed to squeeze in a recording session with producer Bill Skibbe (The Kills, Black Keys, Wild Belle, Protomartyr, Jacuzzi Boys) to work on their second album in Benton Harbour, MI. Keeping true to their DIY ethos, the pair will be releasing their second album Introverted Extroverts on June 15, 2016 via their own label Summer Camp Records and will continue the hard work with an extensive worldwide tour to follow. 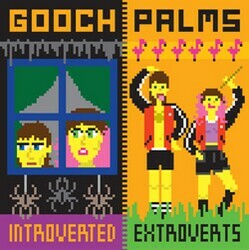 Ask Me Why is the second single from The Gooch Palms' sophomore album, 'Introverted Extroverts,' it's everything you'd expect from the band; catchy-as-hell, gritty and fun.